This is a modified version of the standard 20m beep test adapted for the specific requirements of ice hockey players, created by Leone et al. (2006). The test differs from the standard beep test in that it is conducted on ice and uses a 2:1 work to rest ratio. For more information on the beep test and its variations, see the complete guide to the bleep / beep test. Read more about fitness testing for hockey. equipment required: ice rink with space of at least 50m, hockey sticks, marker cones, 50m measuring tape, audio recording (you can use a custom script for the Team BeepTest software). pre-test: Explain the test procedures to the subject. Perform screening of health risks and obtain informed consent. Prepare forms and record basic information such as age, height, body weight, gender, test conditions. Measure out course and place marker cones. Perform an appropriate warm-up. See more details of pre-test procedures. procedure: The test involves skating back and forth a distance of 45 m while following the pace fixed by an audible signal, while holding a hockey stick with the preferred one hand. Set up the test course with cones or lines on the ice 45m apart, and also markers at the mid point to assist in pacing. The test consists of one minute of continuous skating followed by a 30 second rest period. To start the players stand behind and with the front skate parallel to the end line, and begin skating when instructed by the audio signal. If the second line is reached before the beep sounds, the player must wait until the beep sounds before continuing. The players continue up and back for one minute. At the end of the 1 minute stage the players glide or skate slowly to the closest end of the 45-m course, and wait seconds before beginning the next stage. The velocity for the initial minute is 3.5 m.s–1 with increments of 0.2 m.s–1 for every one minute stage (speed increases every 1.5 minutes). The test continues until the player is unable to keep pace with the speed of the audio (cannot make it within ~3 m of the line). scoring: The player's score is the level and number of shuttles (45m) reached before they were unable to keep up with the audio. Record the last level completed successfully (not necessarily the level stopped at). A VO2max score can be calculated from the maximal velocity achieved. VO2max (ml•kg–1•min–1) = 18.07 × (maximal velocity in m• s–1) – 35.596 (r = 0.97, SEE = 3.01). target population: this test is designed for ice hockey players, though it may apply to other sports conducted primarily on ice. reliability: The reliability of the beep test would depend on how strictly the test is run, the skating skill level and the practice allowed for the subjects. advantages: Large groups can perform this test all at once. disadvantages: Practice and motivation levels can influence the score attained, and the scoring can be subjective. As the test will probably be conducted in cold conditions, the temperature extreme may affect performance. comments: The 30 second rest period after the 60 second skating interval was necessary to avoid undue muscular fatigue or injuries of the back since hockey players rarely skate continuously for more than 30 seconds. reference: Leone M, Léger LA, Larivière G, Comtois AS. 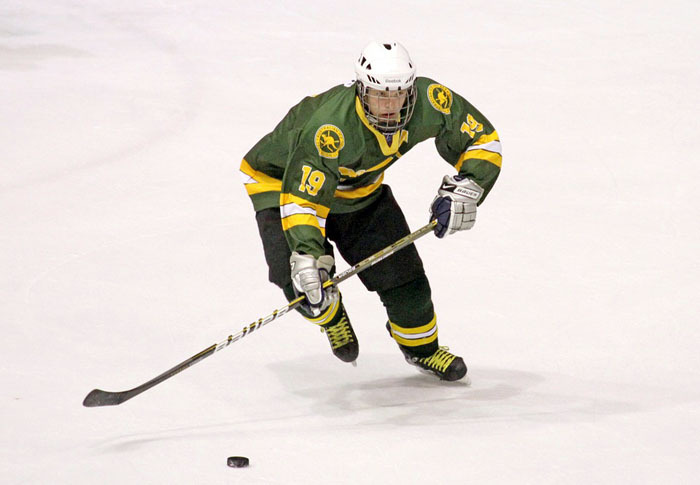 An on-ice aerobic maximal multistage shuttle skate test for elite adolescent hockey players. Int J Sports Med. 2007 Oct;28(10):823-8. - CONCLUSION of article: The results suggest that the SMAT is highly specific, valid and reliable for the prediction of VO2max of hockey players. You can create this variation of the beep test using the team beep test software.